Stopped by the Kelly's on Wyoming and picked up the newest releases in the Samuel Adams limited series, Cinder Bock and Dark Depths. First of all, the name Cinderbock was used on a beer already by the sadly defunct Heavyweight Brewing Company. I don't think the Boston Beer Company has to worry about a lawsuit, as Heavyweight has been gone for about six years now, and the former owner is now busy making flatbread pizzas at his brewpub. Plus, the new beer is Cinder Bock, not Cinderbock. Much different. 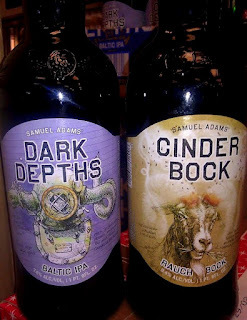 Cinder Bock is a 9.4% ABV Smoked Double Bock that I'm looking forward to trying, as the Double Bock style is one that Samuel Adams has always excelled at making. The 22 oz. bottle goes for $6.99. I already have a headache today, and trying to grasp all that is right and wrong with the second of today's beers, Dark Depths, is making it worse. REALLY putting a new twist on the Black IPA, Dark Depths is termed a Baltic IPA. Bu-bu-but...That makes it a mix between a Baltic Porter and an IPA, right? And a Baltic Porter is a lager, right? And the A in IPA stands for ale, right? So...this beer is an ale/lager/porter/IPA, etc., and two of the hop varieties used are Saaz and Simcoe, an interesting mix. Pass the Advil, please. 7.6% ABV, $5.99 per 22 oz. bottle.